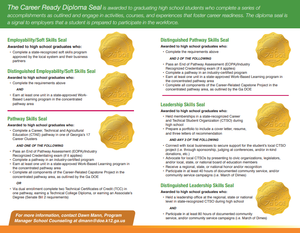 Effective with the Class of 2019, Thomson High School will offer six versions of the Georgia career-ready diploma seal. Suggested supply lists for 2018-2019 are posted below by school. The McDuffie County Board of Education earned Exemplary Status from the Georgia School Boards Association for the third time. At the recent state convention, Hayden McCord and Maggie Huff placed first in the Agriscience Fair-Division 2 Food Products & Processing Systems competition. A high-demand profession, welders possess critical skills needed in construction and other fields. The district is hosting a Family Literacy Workshop series at various locations around the community. Parents receive books and tips to use at home with their children. Demarshay Moss received a laptop at the Augusta Area High School High Tech awards luncheon for her completion of the High School High Tech program without missing any activities, events or assignments during the two-year program. Teams from NES, DES, and TES competed against 25 area schools in the National School Program Golf & Life Skills Challenge. McDuffie County School System students captured five of thirteen regional Young Georgia Authors titles.